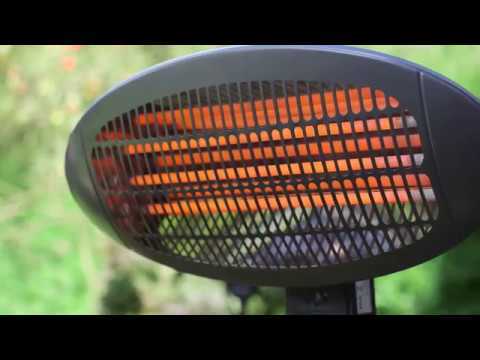 Keep warm when outdoors with this powerful, 2000W wall mounted patio heater by Garden Glow. If you enjoy relaxing in the garden, then this patio heater will help you to make the most of outside spaces even in the evenings when the temperature drops. Electric heaters have many advantages; because they don’t have any flames or burn oxygen they are much safer then gas heaters or fire pits and can even be used indoors. In addition to being safe they also area a source of light, heat a wide area, are silent and are virtually maintenance free. The powerful heater has three heat settings, allowing you to choose the level of warmth needed without wasting any energy. Choose from 700W, 1400W or the maximum of 2000W, perfect for keeping you warm whenever the temperature drops. The innovative design comes with an adjustable head, from 0° to 45°, allowing you to position it to suit your needs. Constructed from durable steel, this heater is sturdy and safe, and even comes added safety feature which will cut the power off from the heater if the plate detaches from the wall it’s mounted on. Quick to heat up, the wall mounted patio heater is the perfect addition to enjoy your garden and entertain guests.